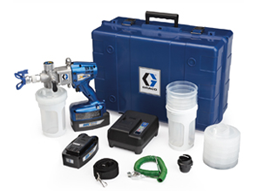 Graco are well represented within our Petrol Airless Spray Equipment, with the GMax II 3900 starting off the range of airless paint sprayers. 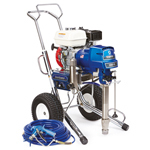 If you're looking for a petrol airless sprayer suitable for primers, emulsions, water and solvent based paint, latex and acylic then the GMAX II 5900 and 7900 Texspray airless pumps are for you. 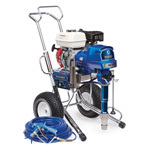 At the higher end of the Petrol Airless Spraying range are the Graco airless products GH 200, GH 230 and GH 300. Our Graco airless spray equipment is extremely popular amongst our customers with good reason. Whether it's airless spray guns, inline filters, suction inlet filters, spray tip extensions or spray tips and guards, we have a range of petrol airless accessories for all your airless spray paint needs. Graco Petrol Powered Airless Sprayer mounted on the standard Hi-boy chassis 3300 psi max.pressure. 6.0lpm delivery. Max tip size 43 thou. Graco Petrol Powered Airless Sprayer mounted on the standard Hi-boy chassis 3300 psi max.pressure. 8.3lpm delivery. Max tip size 48 thou. The 7900 HD Standard is equipped with a heavy duty pump, enabling it to easily spray all thicker coatings as well as the full range of primers and paints. Suited for professionals that don’t need extras but are looking for everyday reliability to get the job done quickly and easy. 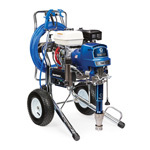 The 7900 HD ProContractor is equipped with a heavy duty pump, enabling it to easily spray all thicker coatings as well as the full range of primers and paints. Packed with innovative features and for ultimate comfort and luxury.